The Lake Kerkini National Park is the ultimate destination for bird-watching in Greece. Home to over 300 species, this wetland is ideal for birdwatchers. Peaceful and inviting, the environment in Lake Kerkini allows the visitor to explore Greece from a different perspective. The still waters are disturbed only when the buffalo swim or eco-tour groups go boating. But no matter how interesting wildlife in this wetland is, the jaws drop when a flock of birds creates shapes of unparalleled beauty in the sky. Greece is an important migratory crossroad of many endangered species and thus one of the best destinations for bird-watching. Surrounded by Mount Belles and only forty minutes away from the Agnatio Hotel Spa in Sidirokastro, Serres, Lake Kerkini is the ultimate destination for Avitourism. There are over 300 birds in Lake Kerkini. Nearly 140 of them call this wetland home while the rest either make a quick stop during their migratory trip or come here to reproduce. The nearby mountains provide nests for eagles, owls and falcons while pelicans, flamingos, herons, storks, nutcrackers, warblers, woodpeckers and many more species add color and melody in the serene environment. Birdwatchers visit Kerkini Lake during the spring since this is the breeding season. But the Kerkini Lake National Park is swamped by thousands of visitors all year long. The best bird-watching tour starts at Vyronia and continues towards the river where birdwatchers can observe a number of species, ranging from little bitterns and crakes to stone curlews, ducks and falcons. 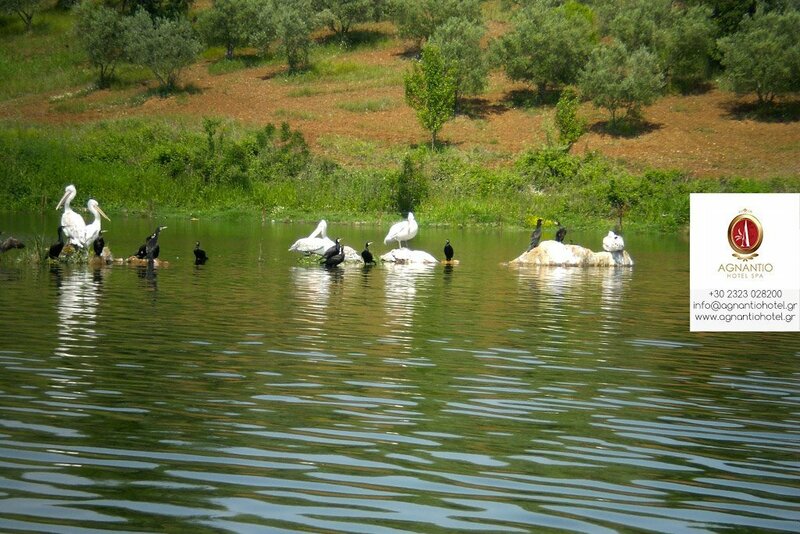 Some common, some rare the bird species in Lake Kerkini vary depending on the season. Some fly, some rest on the man-made lake, and some try to find food at the banks of the lake. Naturalists, bird lovers, eco-tourists, or even visitors curious about this magnificent habitat can go boating, use cameras and binoculars, and take pictures of pygmy cormorants, black-eared wheatears, egrets and so many more birds which make this landscape one of a kind.